Applying to college is both exciting and daunting! 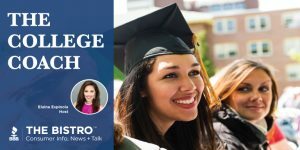 Karen Spencer, A College Admissions Consultant from College Coach, the nation’s leading provider of educational advising, shares important tips in the college application process. More and more business professionals are turning to podcasts for an excellent source of inspiration and education. Podcasts offer insightful tips, advice, wisdom, and invoke the listener to think outside the box while hearing from experts on a variety of topics. 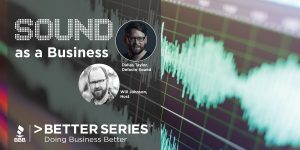 On this episode, we explore how podcasts and other digital extensions can help almost any business find new customers and business with guest, Dallas Taylor, Owner of Defacto Sound and host of his podcast, Twenty-Thousand Hertz. Advances in technology are making the home buying and selling process that much more accessible and exciting for consumers. 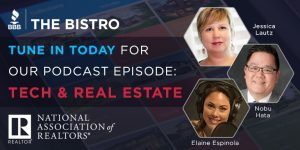 Online searching, virtual tours, and “smart- home” technology are just some examples you’ll hear about in this episode of The Bistro with guests, Nobu Hata and Jessica Lautz from the National Association of Realtors. What makes businesses great and how does one succeed in business? 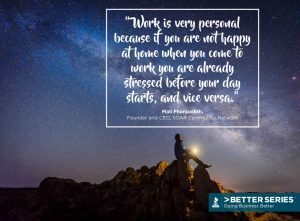 These are questions we have been exploring with business leaders, industry trend setters, and marketplace subject matter experts on the Better Business Better Series podcast. Listen in to a compilation of advice and thought provoking conversations on building a business that matters and leading to inspire. Artificial intelligence (AI) has been changing the lives of humans for decades, but never has AI felt more ubiquitous than now. 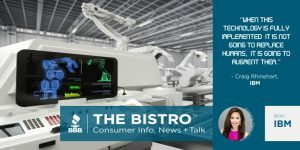 Craig Rhinehart, Director, IBM Watson Health Innovation and Market Development joins us on this exciting episode to share insights on a future with AI and the impact it will have on our lives.